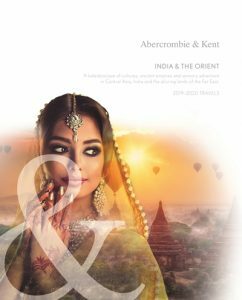 Leading luxury travel company Abercrombie & Kent has just released its new look 2019 Orient portfolio, including luxury private and small group journeys to 16 destinations throughout the Indian Subcontinent and East Asia. Since establishing a presence in China in the early 1980’s, A&K has had over 30 years taking guests on grand adventures to the great cities of the Far East, through exotic jungle climes, along mighty waterways and to places off-the-beaten track. And all with that special brand of luxury that A&K does so well. A luxury journey with A&K means not just travelling in a comfortable chauffeur-driven car or bedding down in a 5-star hotel, it’s not just ticking an important monument off the list or dining in a guidebook recommended restaurant, it means accessing rooms in a palace that are normally off limits, or a collectors-only private gallery viewing, it means meeting the chef and selecting the fresh produce for your meal direct from the market and taking an exclusive museum tour with the curator. It means hearing views from a leading historian on how the past has impacted the present and taking the path less travelled to little visited villages and remote communities. Thirty-five years on, A&K still sets the standard delivering authentic, inspiring experiences that go beyond the ordinary and transform the lives of its travellers. A&K’s Orient Product Manager Rad Rusin has travelled extensively through Asia including the outermost reaches of Mongolia, Uzbekistan and Turkmenistan. She knows which festivals to include in Cambodia and Vietnam, the best spot to deliver alms to local monks in Laos, the most comfortable way to cruise the Mekong, what time to take off for your hot air balloon flight over Bagan and the newest hotel openings. Rusin’s intimate knowledge has shaped A&K’s Orient portfolio which features private and luxury small group journeys through China, Japan, Laos, Mongolia, Myanmar, Cambodia, Thailand, Tibet, Uzbekistan, Turkmenistan and Vietnam with new routes and unique enhancements. On the 10-day Wonders of Cambodia private journey travellers are introduced to the colour, flavours and artistic bounty of this exotic Southeast Asian destination. Guests explore Phnom Penh with a resident linguist and anthropologist, watch dawn break over Angkor Wat, see the best of Cambodian dance and acrobatics and join an arts curator for a private tour of Siem Reap’s best boutiques, ateliers and galleries. Priced from $6,390 per person. The 12-day Myanmar in Style itinerary reveals this enchanting destination with an evening visit to Yangon’s gleaming Shwedagon Pagoda, a 5-day luxury Irrawaddy River cruise aboard boutique ship Sanctuary Ananda and time at Inle Lake seeing the unique leg-rowing fishermen, their stilt villages and vibrant markets. Priced from $6,030 per person. The northern kingdoms of Thailand and Laos are showcased on an 8-day private journey taking in gilded temples, dense jungles and an ultra-exclusive Mekong river cruise aboard the intimate Gypsy. Luxury glamping in the Golden Triangle also provides opportunities to spend time with elephants in their own habitat and there are expert led walking tours and cooking demonstrations. Priced from $18,050 per person. A&K’s 13-day China & the Yangtz luxury small group journey takes an in-depth look at this vast country, its ancient wonders and iconic sites taking travellers up close to the Terracotta Warriors and pandas in their natural habitat and on a winding pedicab trip through Beijing’s hutongs. There’s a 4-day cruise on Sanctuary Yangzi Explorer through the Three Gorges and 3 nights in dynamic Shanghai. Multiple monthly departures are available between March and November, with prices starting from $11,320 per person. The bygone cultures and beautiful landscapes of Yunnan and Tibet are showcased in the 11-day Cultures of Yunnan & Tibet journey which takes guests along the ancient Tea Horse Road discovering villages built on age-old customs and deep spirituality. There is a traditional tea ceremony and time in the UNESCO-listed village of Shuhe as well as local hospitality in a Tibetan family home and an audience with a world-renowned Chinese medical practitioner. Priced from $9,300 per person. Three limited edition small group journeys also feature. One follows the ancient Silk Road in China from Xian to Kashgar, with departures in May and September, and is priced from $9,785 per person. The 16-day Ancient Trade Routes of Central Asia journey reveals Uzbekistan and Turkmenistan and their glorious architectural heritage with stops in exotic caravanserais, markets and bazaars along the way. Departures are in May and September and the itinerary is priced from $11,495 per person. And finally, the 12-day Mongolia’s Golden Eagle Festival with Palani Mohan journey which spends two days at this thrilling festival in the west of the country meeting the Kazakh hunters and horsemen and staying in a traditional Mongolian ger. Departs in October 2019, and is priced from $15,555 per person. This year, the portfolio also features bite-size enhancements attached to most journeys. These are little add-ons to enrich the experience in a destination. For example, a Vespa tour of Hanoi by night, wine tasting in Myanmar’s first vineyard or hot air ballooning over the temple plain of Bagan. There is also a selection of suggested extensions which are shorter itineraries that can be tacked on to another to add a different dimension or round off a stay. They are generally designed for less than a week to one destination and include city stays in Hong Kong and Bangkok, a heritage experience in Luang Prabang, a Cambodian jungle experience at new luxury camp Shinta Mani and a poignant visit to Hiroshima. There are also family-focused recommendations, city stopovers, luxury rail trips, celebratory ideas and an exclusive 12-day journey by privately chartered aircraft, Wings over China.